Thinking like a villager in Asia’s World City? 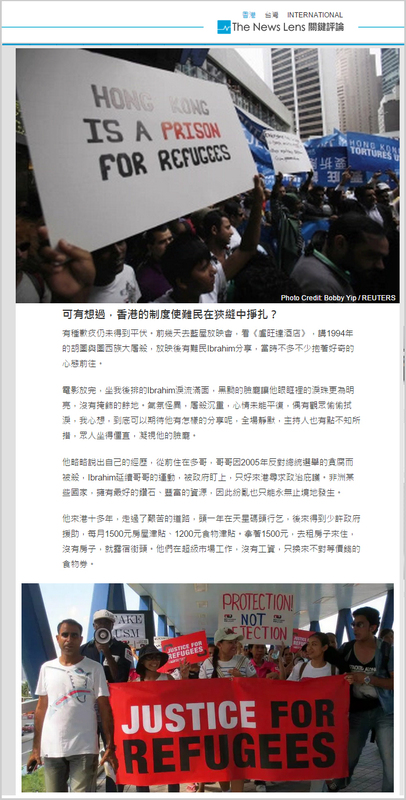 It is reproachable that at times persons whose opinions might be esteemed, and should thus carefully word and base statements on facts, cast judgments that verge on xenophobic intolerance, contrary to the best interest of Hong Kong. As a commentator in a local newspaper recently observed, “We often say we want to be a world Asian city, but we behave like a village”. One example is Mr. Fung Keung’s op-ed published on 8 October in the China Daily, which contains several mistakes to say the least. First, a rise of arrested asylum seekers from 683 to 904 in a three-year span is hardly indicative of a crime surge when contemporaneously asylum applications increased several folds to over 10,000. Comparatively, it could be argued that the crime rate among asylum seekers has decreased over the period, and indeed is quite low given that many work to support themselves. It is notorious that welfare assistance for asylum seekers is insufficient to make ends meet. Second, that asylum seekers are arrested for crimes other than working illegally to a larger extent than before may not necessary show that asylum seekers are turning to violence. Rather it may be dependent on which crimes and who is policed in society, and related priorities of law enforcement. Third, Fung hints that the victims “are believed to be Hong Kong citizens” and asylum seekers should not be accepted in Hong Kong because the city owes them nothing. 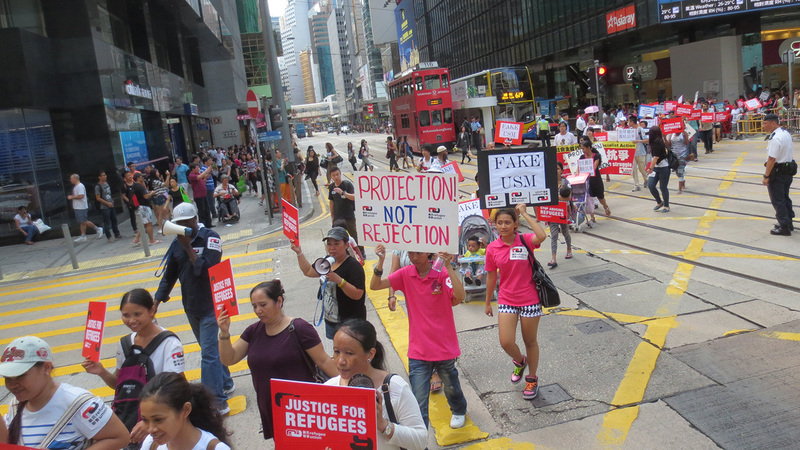 Rather asylum seekers, when compared to Singapore, make Hong Kong dirty and unsafe, hurting citizens who would otherwise live in a peaceful environment. 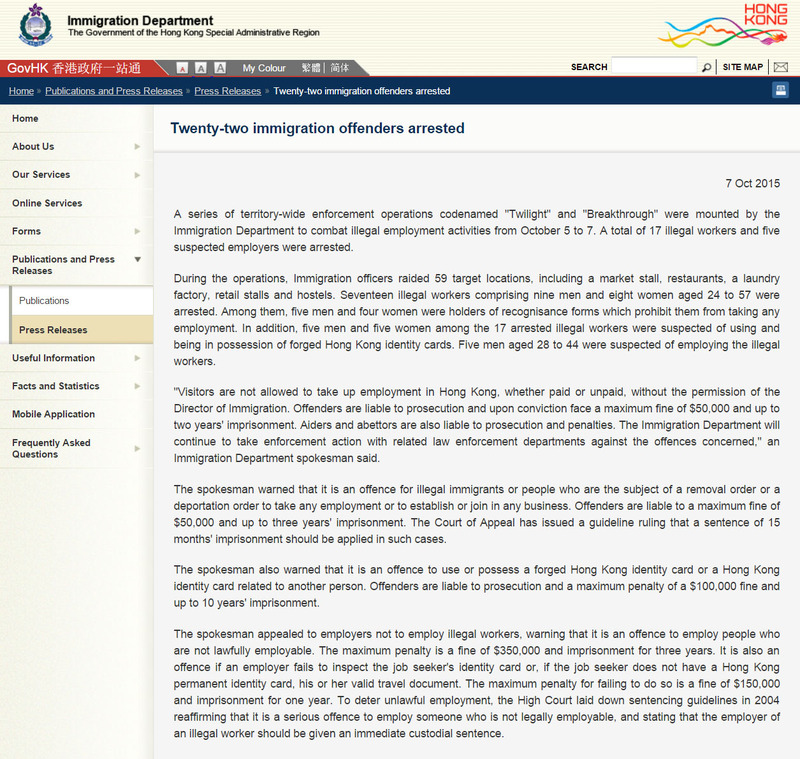 Overlooking for a moment international and domestic legal obligations towards refugees, Vision First queries, does Fung really think that local citizens do not commit crimes? 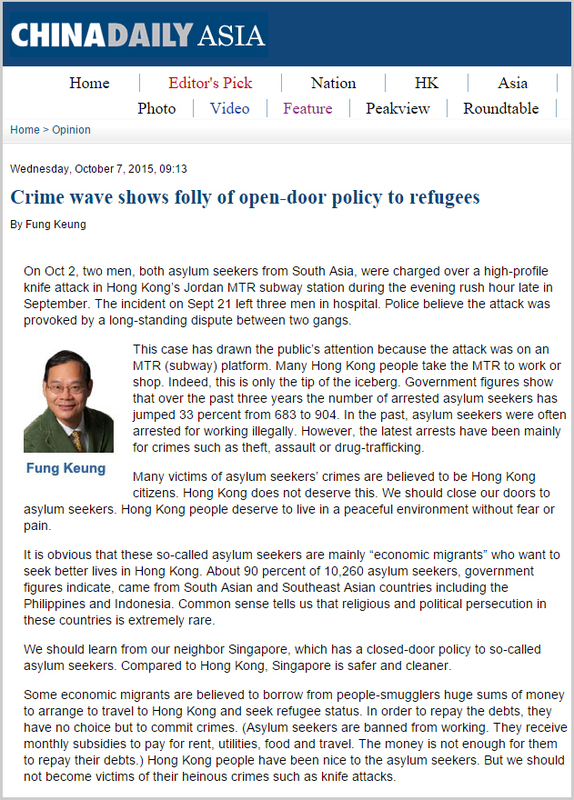 Who does Fung think are the employers and recruiters of asylum seekers? 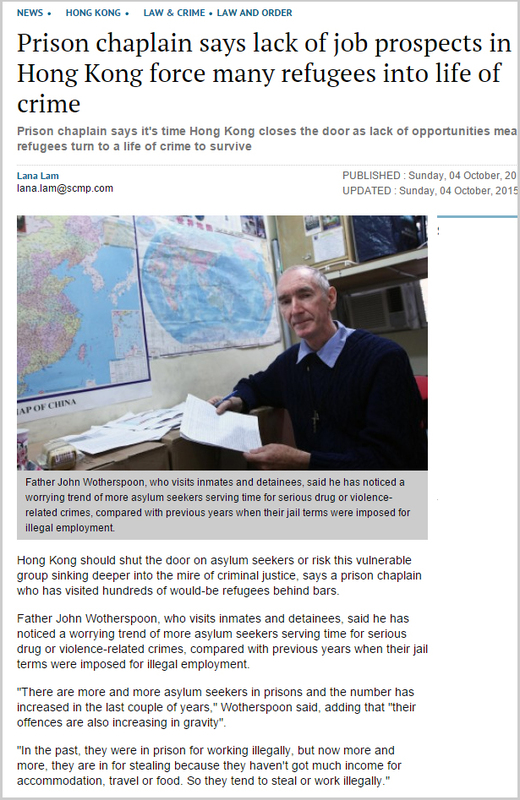 Who does Fung believe are the people whose behavior is learnt and with whom connections are made in local prisons by asylum seekers? Perhaps an overview of police charts would have helped Fung formulate more accurate opinions. 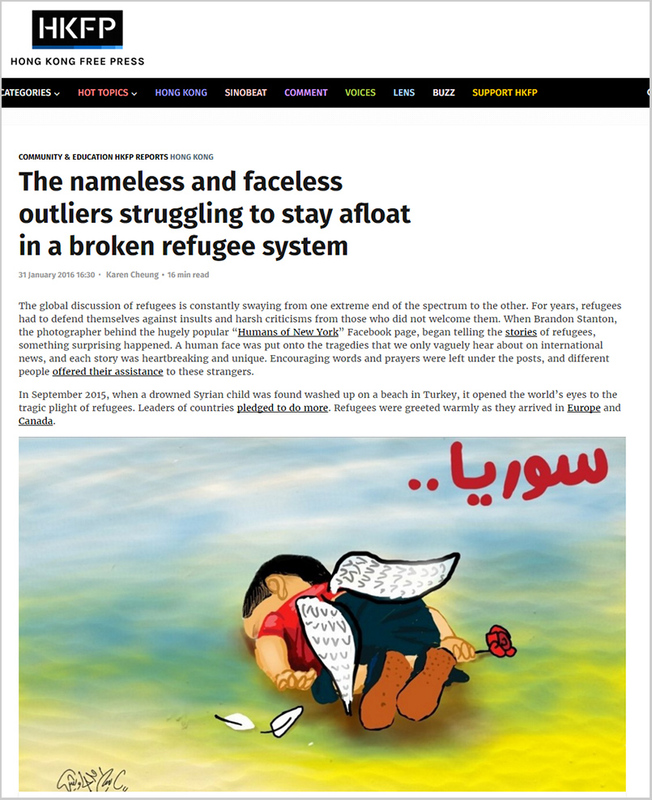 Fourth, it is arguable that asylum seekers borrow money from their smugglers, leaving them no choice but to commit crimes to repay such debts. This would certainly be a situation akin to trafficking, in which case Fung should be concerned of Hong Kong responsibilities in setting up a policy framework that tolerates such circumstances. 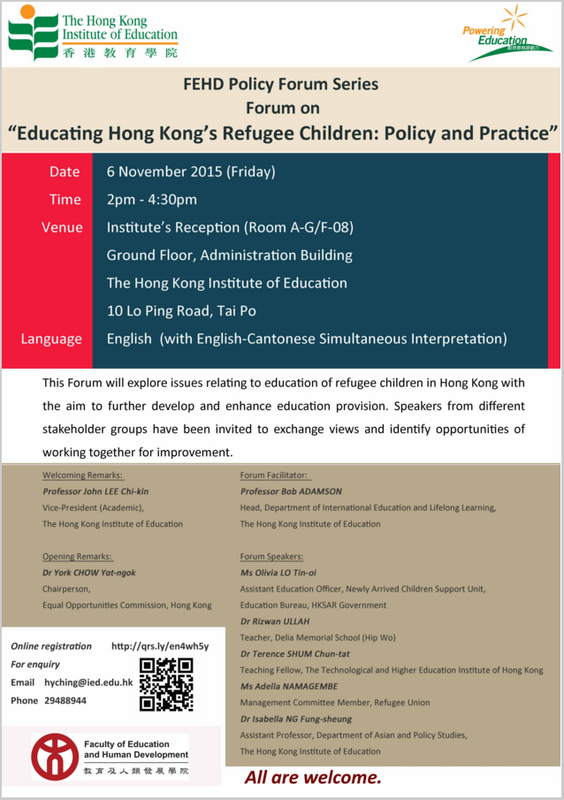 In reality, research supports conclusions quite opposite to Fung’s intolerant views. Vision First would certainly appreciate if Fung agreed to disclose the research he conducted to ground such opinions. A rapid search online did not produce satisfactory results. Fifth, Fung argues that it is “common sense” that “tells us that religious and political persecution in these countries is extremely rare”. Vision First cannot but query if the same “common sense” is used by immigration officers and adjudicator when screening asylum seekers. The increasing number of rejections being quashed by court judges, often for failure to fully appraise country of origin information, would certainly call for a revision of such unhelpful “common sense”.